This article series in short: if you wanna go hiking to the Canary Islands, go to La Gomera and do GR 132. Howgh. In long: La Gomera is the Island for hiking within the Canaries. The truth is though, that whatever island you go to, you can please the hiking heart everywhere. But La Gomera, oh! 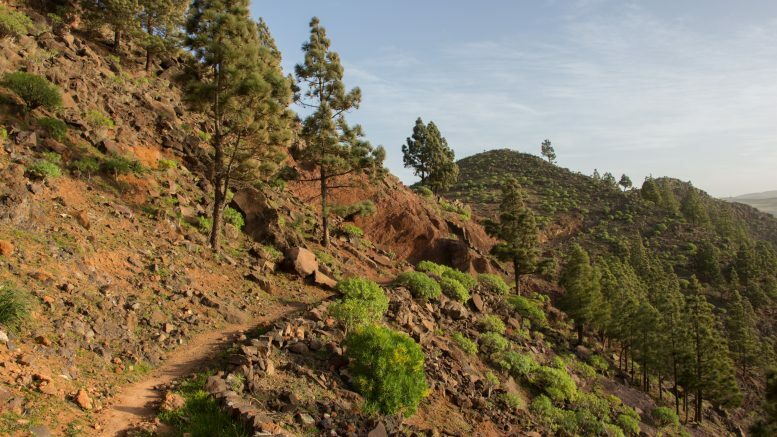 With its deep and long ravines (in Spanish barranco), remote rocky beaches and constant remembrances of pre-European and early Spanish settlers, is my favourite Canary island for hiking. And the nature? Magical. You’ll see soon. It’s about 120 / 130 kilometres long (depending on a route variation you choose in the middle) and can be walked in both directions. Official guides and information signs along the route tell you to do it anti-clockwise. I did it clockwise instead. To sum up: the following report is from a 6 day, wild-camp, clockwise variation. Even though the track looks quite popular, I didn’t meet a single person in 6 days who’d hike it too. Technically, wild camping is forbidden in the Canary Islands. Practically, thru-hiking GR 132 would be almost impossible without it. Compared to mainland Europe, La Gomera is a very remote place with only 1 campsite on the island. Remote villages are often without accommodation options and if they have hotels, they’re often booked out in advance since La Gomera is a popular tourist destination, especially for Germans. I always wild camped while keeping wild camping ethics extra high, considering fragile and unique nature and ecosystems. Building a bivi on a suitable place after sunset and disappearing without a trace of being there before the sunrise is par for the course. There is a lack of water in the nature. It also seems like La Gomerians like playing the “build a fountain but don’t add water” game. Therefore, whenever you have an opportunity, refill your water bottles. An old guy cleaning a car, a young chick watering the garden, gas stations or bars. All of them are great opportunities to refill your water bottles. There are small bars and shops on the way. I always carried food for two days and 3 litres of water. With good planning you can get by with a 1 day food load and most of the time less water too, but sometimes I prefer to prioritize independence over minimizing weight. More information about hiking in La Gomera in general I’ve summed up in a separate article. The whole track is very diverse with some really dry sections so plan ahead if possible. In my report you can find tips on where to find water, resupply food or pitch your bivi. Be the first to comment on "GR 132 in La Gomera report"